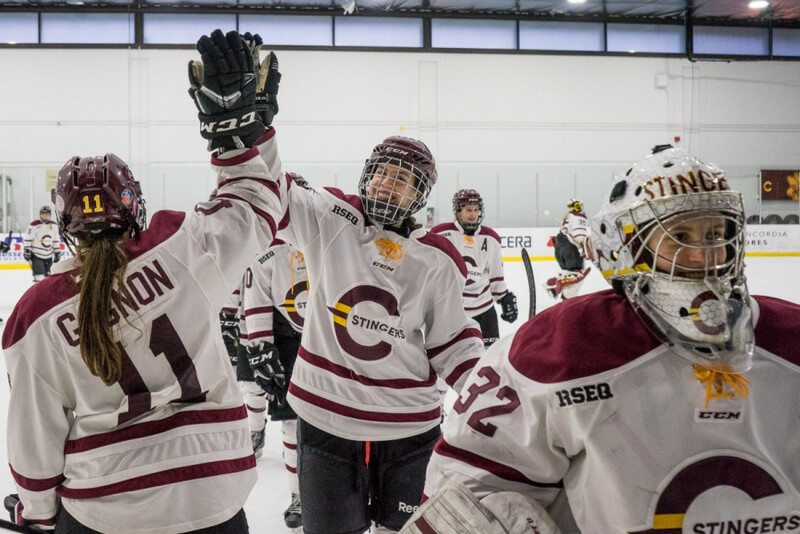 The Concordia Stingers women’s hockey team returned to Ed Meagher arena Saturday for a must-win game two against the Université de Montréal Carabins in the Réseau du sport étudiant du Québec finals. From the way the first period played out, it was clear that both teams were playing it safe. With ten shots between the two of them, defense and avoiding mistakes at all costs seemed to be the priority. That made Stéphanie Lalancette’s goal with three minutes left in the period to give Concordia a 1-0 lead all the more important. A notable addition to the Stingers lineup was goalie Katherine Purchase, who made her return after an undisclosed injury sidelined her for the last two games. Lalancette’s goal blew the game wide open and it was almost entirely one-way traffic towards the Carabins’ net throughout the second period. The pressure paid off only three minutes into the frame as a point shot from Brigitte Laganière rocketed it into the top corner with no chance for Carabins goalie Marie-Pier Chabot. After a shorthanded goal from Montréal’s Annie Germain made it 2-1, the Stingers doubled up on the pressure. Concordia kept piling it on and captain Marie-Joëlle Allard extended their lead to 3-1 through a timely power play goal with three minutes left in the second. The third period returned to the back-and-forth hockey that characterized every meeting between the two teams. A nicely constructed string of passes gave Carabins forward Jessica Cormier a wide open net to pull Montréal to within one with fifteen minutes left to tie it up. There was a dark point to the game, after Laganière went down hard in the corner and needed to be escorted off the ice without being able to put pressure on her leg. After that, les Carabins piled on the pressure late and tried to create chances but the Stingers were having none of it as Purchase and the rest of the team shut the door. The Stingers will return to the CEPSUM to play the decisive game three tomorrow at 2 p.m.